I have officially entered the 4th year of student loan repayment, and I must tell you that the start of each year I have felt more and more confident about finally paying them off for good. I’ve been able to refinance my loans multiple times and ramp up payments whenever I had some extra money. Strict budgeting has enabled me to set aside money for student loans before spending it elsewhere. I started this repayment in December of 2012 and I’m hoping that 2016 will be the last year that I make a payment. It sure as heck beats the original 10 year payback period that comes with most student loans! I was able to make a total payment of $2300 this month which is an increase over the past few months and a great start to the new year. I’m also under $10,000 and I’ve finally taken off another digit. My loans are only “four digits” now and that’s a huge milestone for me. I think it’s the boost that I needed to start off 2016 headed in the right direction, and hoping that everything is downhill from here. 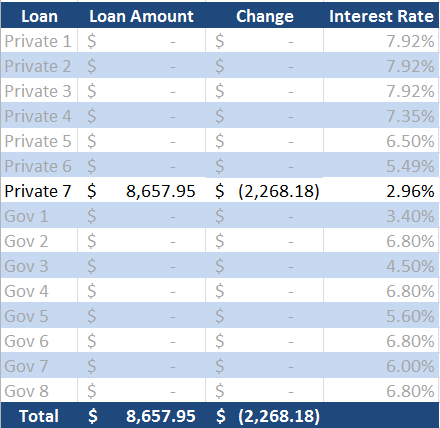 Since I have $8650 remaining on my loan, if I go with an estimate of paying $2200 each month towards the principal I should have my loan paid off by May. I might average a little bit more than that, but was just going with a conservative estimate to start off. I would still come up about $900 short and have to make a payment in May to finish off my loan completely. But I will be saving around $30 in interest accruing because of having a lower balance y around $1100 which is definitely worth it. You also have to factor in that I might able to squeeze out $2300 payments towards the principal with a smaller balance accruing less interest, and [last year] in March I was able to make a payment of $3800. If I can do that and keep my spending low over these next few months, I might be able to squeeze out being student loan free by April. I’m going to make that my stretch goal for my student loans and I’ll see what I can do. I’ve been working towards this goal and making it my priority for such a long time – I think I can do one last big push. I’ve also been notified by my loan provider that my interest rate will be rising again, which makes sense because of overall interest rates finally being bumped up. It was estimated that my rate will end up around 3.10% for next month, which still is much lower than my previous rate. The rising interest rate gives me even more motivation to pay this loan off as soon as possible! Almost home free! Keep on keeping on. Awesome job! Thanks for following along 🙂 Should be soon!